Stillman Bank’s Board of Directors recently recognized Gary L. Rhodes for his 50 years of service at Stillman Bank. Rhodes began his banking career in 1968 as Cashier in the Bank’s Stillman Valley Office. He held numerous positions throughout his career and recently retired as Chairman and CEO of Stillman Bank. He currently serves as Chairman of the Board of Stillman BancCorp, Inc.
“We congratulate Gary for reaching this impressive milestone,” said Martin C. Larson, Chairman and CEO of Stillman Bank. “We recognize that it is because of the commitment of employees like him that we have been able to continue to grow and serve our customers.” At a special Board of Directors dinner, Gary was recognized for his distinguished length of service and his commitment to serving others and the financial services industry. The Illinois Bankers Association (IBA) has also recognized Gary L. Rhodes for over 50 years of service to the banking industry. Rhodes is now inducted into the IBA’s 50 Year Club. 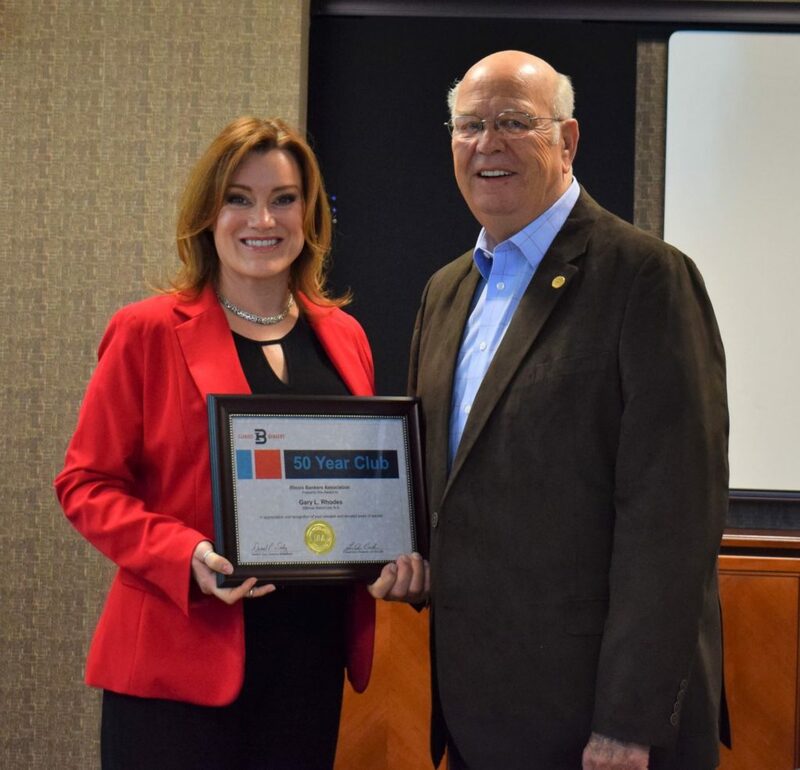 Julie R. Clark, Vice President, Bank & Partner Relations at the Illinois Bankers Association presents Gary L. Rhodes his 50 Year Club certificate and lapel pin in December 2018. “We are fortunate to have dedicated bankers like Gary Rhodes, who has been working for his customers and community for half of a century,” said Julie R. Clark, Vice President, Bank & Partner Relations at IBA. Throughout his career, Rhodes has been very involved in community organizations. He served on the board of the Ogle County United Way, Ogle County Economic Development, was a board member for the Illinois Bankers Association, the Congregational Christian Church in Stillman Valley and served as Capital Campaign Chairman for Serenity Hospice. Rhodes was also recognized by officers and employees at a companywide event in December.